It comes as a surprise that with a population of over 350 million people, and an emerging business aviation market, the Middle East represents less than 3 per cent of the world's total business jet fleet. There is a misguided perception that the region is just made up of deserts and barren land, but the landmass is 90 per cent the size of the United States, and is home to over 30 million more people. Bombardier, the global giant in aircraft manufacturing, believes that there are a number of factors for this comparatively subdued growth. The political circumstances over the past number of years has certainly affected the development of the market, and a startling statistic has shown that despite a global increase of 15 per cent, the Middle East was the only region in the world this year where the number of billionaires dropped - from 84 to 66. A recent market research study carried out by Jetnet, found that by 2023, the Middle East's fleet is expected to grow to almost 1,000 business jets, whereas North America's fleet is expected to grow by up to 12 times that amount in the same period. Heavy business jets account for over 70 per cent of the Middle East fleet, and large jets account for 24 per cent of the deliveries predicted by Bombardier over the next 10 years. A common perception of the Middle Eastern market is that it is obsessed with sumptuously configured ultra-long range aircraft, and that buyers are motivated by the superficial status symbol of the corporate jets rather than as a means for business. Further investigation into Jetnet's research shows that a quarter of the region's total fleet is made up of the Airbus and Boeing aircrafts, whereas the most popular aircraft in the Middle East is the larger Bombarier Challenger 605, closely followed by the Boeing BBJ1. In an environment where cash buyers were more dominant, consumers are now becoming more savvy as the market matures. French manufacturers Dassault see huge potential for their Falcon jets in the Middle East. Olivier Villa, senior vice president of the company said, "I recently spoke to a Saudi businessman who was trying to calculate the life cycle costs of aircraft. He looked at the 7X, because he had previous experience, but then queried what he really needed, which was range, so he is now considering buying the 2000LX until the 5X is available." The pre-owned aircraft market has suffered due to the higher demand for new business jets. Aircraft in the Middle East spend an average of 582 days in the marketplace, which significantly outweighs the global average of 391 days. Scott Plumb, senior vice president for sales at Jetcraft has highlighted this issue. "Buyers are having to discount these aircraft to below their expectations to get them moving. ACJ and BBJs are spending well in excess of one year on the market." 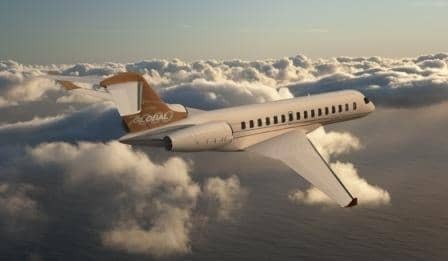 He also eluded to the fact that sales of Bombardier jets in the Middle East - as well as other regions - have taken a hit. "Roughly two Global XRS aircraft are selling a month. Unless you're pricing to be one of those two, you're not going to sell." The muted growth in the market is not only confined to bizliner sales, as aircraft brokers around the world continue to witness problems with the Gulfstream G550 inventory, which has doubled in the first six months of the year. Thierry Boutsen, president of Boutsen Aviation says, "One of the toughest markets is the G550. There were seven for sale in December 2014, and now there are 35." Alternatively, according to Steve Varsano, founder of The Jet Business in London, "The number of G550s for sale is still tiny, and the aircraft has held it's value tremendously well." Christopher Zarnik, president of Corporate Concepts says that "sellers in the Middle East prefer a 'make offer' rather than putting a price on their aircraft, as it will stay a lot longer on the market." Mr. Lodge of Jetbrokers added that some of the custom interiors, common in the Middle East, also have a negative effect on the aircraft's potential for resale. "Owners spend a fortune on an interior that no one is prepared to pay for."